← JQuery .prop and .attr are NOT created equally!! 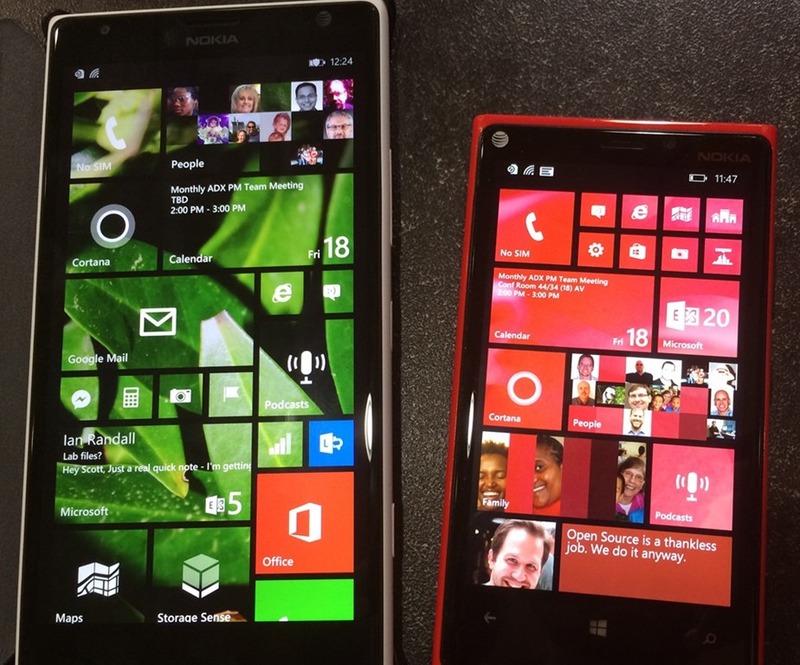 Flirting with the Windows Phone. Cheating might be soon! Ok. So cheating in general is very very bad. (just in case my wife happens to come across this post and only reads the headline. I have had an IPhone since 2006 and have been happily going along my merry way until Windows 8.1 recently caught my attention. They have really come a long way in the mobile phone industry the last few years and I am finally seriously considering purchasing one. My parents just got the Nokia 1520 and I’ll tell you, I was impressed. Nokia has an impressive 6 inch screen is just enough bigger than my IPhone 5 to make the swiping and selecting easier to accomplish. The touch gestures are much more fluent and intuitive with the tiles and icons that are part of the OS in Windows 8.1. One thing that Windows seems to be accomplishing better than Apple has over the years is a consistent look and feel. Whether or not that is Windows directly or just the cowboy attitude of the Apple fan boys, I’m unsure, but when I started using my fathers windows phone the other day, once I understood the AppBar and CommandBar, everything else was elementary. As Scott Hanselman mentions in his post http://www.hanselman.com/blog/WindowsPhone81HasMyAttentionNow.aspx, There are a bunch of nice features that come inside the new OS that have been long time coming, but are here! Notification Center – This is something that I love about my IPhone. Having one location that you can get all your important updates (whether it be email, missed phone calls/voicemails, app notifications etc..) at this point is essential. Windows has now entered this realm and added the functionality to be notified in one place when updates occur. A NEW feature the IPhone doesn’t have is allowing you to change your quick buttons to different things, giving you more flexibility that the IPhone does not have. Pinnable Website Tiles – You can now have a tile that sends you directly to a site. Can be handy on sites you visit often. Sort of like a favorites bar on your home screen. Cortana Voice Assistant – In my eyes, this is a big one. Contana has become the voice assistant (Siri on the IPhone) for Windows. They have made this feature a huge advantage over Siri with all of the advances that they made in the API as well as it’s intelligence. To hear more about it, there was an excellent video on channel9 http://channel9.msdn.com/Blogs/Dev-Inspiration/What-Developers-Need-To-Know-About-the-Cortana-API. This video talks a lot about the developer API, but even if you are not a developer, you can still appreciate what went into this and what makes it superior to the other platforms. Consistent Design and Best Practices – As mentioned before, Windows is really hitting hard in better consistent and seamless design that makes applications look the same across the board. I think this is great for developers. Less designing for the different platforms. Driving Mode – This is just great. You can set an auto response to preople texting you while you are driving by telling the phone to auto send a text whenever Bluetooth is attached to a particular device (ingenious if you ask me). Battery Sense – This feature allows windows to sense what applications are eating the most of your battery and put them in the foreground. All in all, I thin that Microsoft has come a long way in the mobile phone space and are really starting to become a competitor. For me this is great because I am primarily a .NET developer and quite honestly are not the biggest Objective-C fan. I personally think Apple has a long way to go for XCode to even hold a candle to Visual Studio, but that’s just me. I am currently looking for new ideas on a new windows phone application, so f anyone out there has some ideas they want to share, let me know. 1 Response to Flirting with the Windows Phone. Cheating might be soon!